A photograph of two City employees who have been inspecting dikes wearing lifejackets over their clothes. A photograph of a security checkpoint, including a police car, a Caterpillar, and a trailer, on Kingston Crescent during the 1997 flood. A photograph of flooding over Highway 75, looking south from a dike. A photograph of Highway 75, looking north from a dike. Trucks and military vehicles can be seen. A photograph of the open floodway gates, water rushing through them, on the Red River during the 1997 flood. 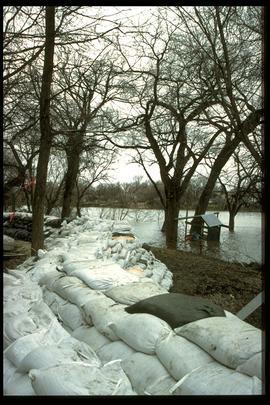 An east-facing photograph of Courchaine Road in Winnipeg at the floodway gates during the 1997 flood.